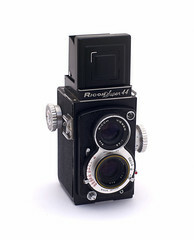 The Ricoh Super 44 (リコースーパー44) is a Japanese 4×4 TLR made by Riken in 1958–9, during the brief 4×4 camera boom. 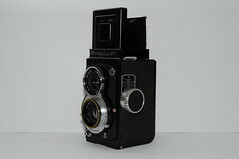 The Ricoh Super 44 has the classical TLR shape and a predominantly black finish. The front standard moves back and forth for focusing; it is driven by a knob on the photographer's left, with an additional plate for depth-of-field indications. The distance scale is either in feet or in metres, down to 3½ft or 1m, though one isolated example has been observed with both scales in different colours (red for feet and black for metres). The advance knob is on the photographer's right, and contains a film reminder with ASA and DIN indications. The film advance is controlled by a red window on the left of the back, protected by a cover horizontally sliding under a metal plate engraved JAPAN. Some examples sold through the PX shops have a diamond-shaped E.P. marking on the same plate. The back itself is locked by a key at the top, with O and C indications. The name RICOH Super 44 is written on a nameplate in front of the viewing hood, and the body serial number is engraved above in small characters. There are strap lugs on both sides of the body. The hood has a large magnifying lens hinged on the back. It also has slits at the front, forming a square: this is an eye-level framing device similar to the Voigtländer Kontur finder, where you have to keep both eyes open and the bright line seen by one eye seems to float inside the image viewed by the other eye. The focusing screen has parallax indications: red triangles at the top for the closest distance and yellow triangles at the bottom for the infinity setting. The release button is placed at the bottom of the front standard, on the photographer's right. There is a PC synch socket buried at the top of the front standard and a hot shoe on the right-hand sideplate, in front of the advance knob; the latter feature, shared with other Riken cameras, was quite uncommon at the time. The taking lens has three elements and is engraved RIKEN RICOH 1:3.5 6cm with a five-digit serial number. The viewing lens is engraved RICOH VIEWER 1:3.5 6cm and has no number. The shutter is a Citizen MV (B, 1–400) enclosed in a casing surrounding the taking lens. It is wound by a lever at the top left of the lens, on the photographer's right, and the speed is set by an index on the same side. The aperture is set from 3.5 to 22 by an index on the opposite side. Next to it is the lever for the self-timer, and there is an M/X selector at the bottom. Speed and aperture indications are written upside down, so as to be read from above when the camera is tilted upwards by the user. The shutter name CITIZEN MV is written between the two lenses and the maker's name RIKEN OPTICAL is written below the taking lens. Ricoh Super 44 original case and box. Ricoh Super 44, four-digit body number, Ricoh 6cm f/3.5 lens no.19452. The lens cap is made of black plastic, embossed RICOH at the bottom. Most examples of the Ricoh Super 44 come with some sort of filter holder attached to the taking lens, decorated by a thin yellow line. The tan leather case has RICOH Super 44 printed at the front. The camera was sold in a white and black box with black, white, pale yellow and pink markings. This box contains the camera, case, shoulder strap, instruction manual and lens cap. The dimensions of the camera are 64×80×120mm and the weight is 679g, according to a contemporary brochure. The Ricoh Super 44 was announced in Japanese magazines dated December 1958 and was advertised in Japan for less than a year, until September 1959. The price in Japan was ¥9,800 (including the ¥800 case), and in the US it was $42.50. The UK price was £16. The advertisement in the May 1959 issue of Asahi Camera, placed by the distributor Misuzu Shōkai, certainly pictures the first prototype with taking lens no.10001. Lens numbers have been observed up to 26919, but the sequence was perhaps shared with the Ricohmatic 44. Body numbers are confirmed from 5222 to 16764, in a sequence that was certainly specific to the camera and perhaps started at 5000. A very rough estimate of the production would be between 10,000 and 15,000 units. ↑ Picture of the complete set observed in an online auction. ↑ Kokusan kamera no rekishi, p.414. ↑ Source: Japanese advertisements dated April and May 1959, reproduced in Kokusan kamera no rekishi, pp.319–20, and US advertisement dated March 1959, observed in an online auction. ↑ Detailed in Amateur Photographer magazine's 1960 guide to new camera models. ↑ Advertisement reproduced in Kokusan kamera no rekishi, p.319. McKeown, James M. and Joan C. McKeown's Price Guide to Antique and Classic Cameras, 12th Edition, 2005-2006. USA, Centennial Photo Service, 2004. ISBN 0-931838-40-1 (hardcover). ISBN 0-931838-41-X (softcover). P.831. Sugiyama, Kōichi (杉山浩一); Naoi, Hiroaki (直井浩明); Bullock, John R. The Collector's Guide to Japanese Cameras. 国産カメラ図鑑 (Kokusan kamera zukan). Tokyo: Asahi Sonorama, 1985. ISBN 4-257-03187-5. Item 2247.